I leaped out of bed and ran to a doorway, just as I’m thinking, “dear God, my baby is upstairs!” I had horrible visions of the second floor crashing down, and as I ran to the stairs, the quaking stopped. I haven’t found any damage to our house, but the adrenaline rush was intense. According to this video link provided by my brother, it is forecasted that we may get a 6.1 quake, as these could be “foreshocks”. YIKES!!!! I sure hope all the structures around here hold. We have been having numerous little quakes in the past week. They were mildly entertaining as I’d be sitting in a meeting and we’d say, “look, the projector screen is shaking — that must be an earthquake,” and we’d all chuckle. Friday night was no laughing matter in my eyes. More details here. Fingers crossed for us! I look ridiculous. I have the worst sunburn I have had since probably high school… We went to Kirkwood yesterday to usher out the 2008 ski season, as it was closing day there. All I’ve been wishing for this Spring was a warm t-shirt wearing day with slushy ego snow. I finally got that day yesterday, and I think it might have been my favorite day all ski season. The snow was pure, unadulterated, slushy ego snow goodness. I can’t put in enough adjectives to describe how great the snow was. I wore my Guns (i.e. powder skis), my fat boys, and man, they tore up the slush. I felt like I could ski anything. And that was a good thing, because I was skiing with my brother (who is an AMAZING) skier, and his other amazing skier friend, and friends of the friend… Adding up to me skiing with five really great men skiers. I felt like one of those chicks in a Warren Miller flick. Except that I wasn’t skiing all the more extreme stuff they were doing in an effort to go fast and keep up with them. But it was so fun. They really made me step it up, and the ego snow meant I could step it up and feel a bit like a rock star for a day. I took the 4:05 chair up on the last day of the season. For you non-skiers, chair lifts usually close at 4, so that was like icing on the cake when I got a bonus run in. There were like 40 people just hanging out at the top of Cornice Express after that last chair of the day, with everyone wanting to be the last one down. I took my time on that last run, enjoying the view and reflecting on how much fun I had on the slopes this year. And since I was so involved in the awesome skiing, I didn’t even think to reapply my sunscreen, and I have the WORST raccoon eyes sunburn I think I’ve ever had, with a lovely red neck to go with it. My nose is so blistered that when I itched it last night in my sleep, the blister broke open. So not good. I think I aged the skin on my face 5 years yesterday, BUT IT WAS SO WORTH IT. My soul actually got younger!!! Anyway, gotta run. I’ll post on these darn earth quakes later today! I dedicate this post to my sister-in-law, who emailed me today pleading that I post again, as the booger post below this was making her sick. Life has been crazy hectic again. I’m finally getting over my cold, and now Little Miss got sick last night, and I think we got a total of 2 hours of sleep. Dragging today for sure. So what did I say? It’s hard to say it eloquently on 2 hours of sleep with a toddler chatting in my ear, but here it goes. I told them to start exploring career options in high school, by asking to do job shadows, and taking personality tests. I have had so many great personality tests in trainings from work, and I think having that information back then might have made me choose a different education and career path. All of the speakers conveyed that college was FUN. But I helped bring the kids down to earth telling them how I lost my full ride scholarship by one tenth of a point on my GPA my first semester. In other words, I told them to have fun, but also remember what is at stake. I told them about how I wanted nothing more than to leave New Mexico and find a big corporate job upon graduating from college, which I did. I loved the job, but discovered that WHERE you live is just as important as what you do, as I really detested living in Michigan and working in downtown Detroit. I told them about some of the cool jobs I had in General Motors, and how at age 24, I had a mind blowing budget of $14 Million dollars. Then I told them how I decided to move out West and found a company to move me, which they did, and then proceeded to lay me off 5 weeks later. I think it’s hard for someone in high school to understand what that feels like, but I drove home the point of just because you’re young and educated doesn’t mean you’re immune to down sizing. I also told them that building your own networks was the key to being able to find a job (i.e. pick yourself back up when that happens), and illustrated that with how I convinced my next employer to create a job that was perfect for me. Anyway, that was the gist of the presentation. Education is king (not to mention much more fun than the REAL world), and that they could take control of their own destiny. The kids were engaged, dressed to the nines in business attire, and really impressed me. I hope they learned a few gems from me. On Monday, I started volunteering with the Junior Achievement program, where I go into a class of third graders and teach them about business once a week for five weeks. I had an absolute blast teaching the class (got to live out the idea of being a teacher for a short time), and am looking forward to continuing this process. Once again, the kids were really engaged and eager to participate. I got such a big kick out of writing my name as Mrs. Bellin on the white board (evidently chalk boards are passe now) as I introduced myself. I’ve always wanted to do that. I just have to say how cool my employer is for providing these types of opportunities for myself and other employees to give back to the community, as it really helps provide me with a sense of fulfillment. That’s me at 16 as a drill teamer. I look back at that picture and remember that I thought I was fat back then. Someone even told me at that age that I couldn’t afford to gain any more weight. Well, I afforded it, that’s for sure, but I’m still healthy, even if a bit heftier. But still, I think that picture helps illustrate how warped a teenage girl’s view of reality and her own body can be. 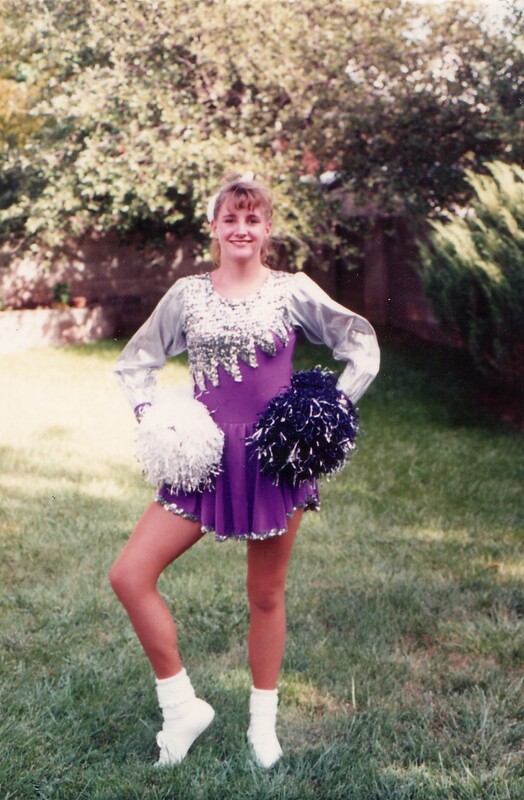 Oh, and to the drill team picture, one of the high schoolers reacted, “it’s amazing how dated that outfit is.” Really?! I guess drill teamers and cheer leaders dress a lot sexier now-days, don’t they? I’ll try not to let another week go by without another post. Ack. Sorry for my lack of posting. After saying 2 weeks ago how our family had been remarkably healthy this winter, we all three got colds. Little Miss is healed (for now, knocking LOUDLY on wood), but JB and I are having coughing deuls that have relegated us to separate beds since it’s the only way we don’t keep each other awake. Man, imagining my kid on that combo is a funny thought. The Willows Lodge has to be one of the nicest accommodations I’ve ever stayed in. I had a jacuzzi suite with a gas fireplace, flat screen HD TV with surround sound, and a walk-out patio. It was a shame to check out this morning, and the website just doesn’t do this place justice. It is right next to the Sammamish River, which has a beautiful bike path along it. I really enjoyed the rural atmosphere with walks and runs on that path when I wasn’t in my marathon meeting. In the lobby of the hotel, they also have a Bassett Hound that sleeps most of the day on a stationary dog bed with a sign in front it saying, “Complaint Department”. I have to appreciate their humor, and realized how refreshing it was to stay outside of the normal hotel chains for a change. Huh. I’m not sure that glue is much better than poo. That was when I realized that the stuff on her face that I thought was snot was glue. Lovely. I had to get up at the unGodly hour of 5:30am today, and am currently at the Reno-Tahoe International Airport awaiting my flight to Seattle. I’m headed up for three days of marathon meetings. Aren’t you envious?! The Mammoth trip went well, despite JB getting sick the day we departed for the mountain. Little Miss had a blast hanging out with her grandparents this weekend. It was hard coming back on Sunday only to leave her again on Tuesday. When I told her yesterday I was going to get on an airplane, she said, “no, Mommy, no airplane”. I’ll post pics from our trip soon. Flight is boarding. Ciao!